Oklahoma City, Okla. – December 4, 2013 – By Christa Morris – The world’s best open riders battled it out in the final section of the nearly $500,00-added National Reining Horse Association (NRHA) Futurity Open during the NRHA Futurity & Adequan® North American Affiliate Championship (NAAC) Show. With today’s runs completed, reining fans moved one step closer to seeing the NRHA Futurity Open Champion earn $165,000, a piece of the estimated $1.5 million+ open purse. 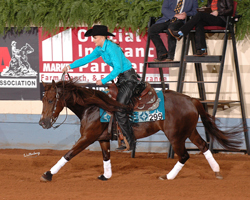 The show runs through December 7 at Oklahoma State Fair Park in Oklahoma City, Okla. with the NRHA Futurity Open finals being featured on the closing day. Ref Magico (Big Chex To Cash x Skeets Genuine Miss) and NRHA Professional Jordan Larson won the first go-round with a score of 222.5. 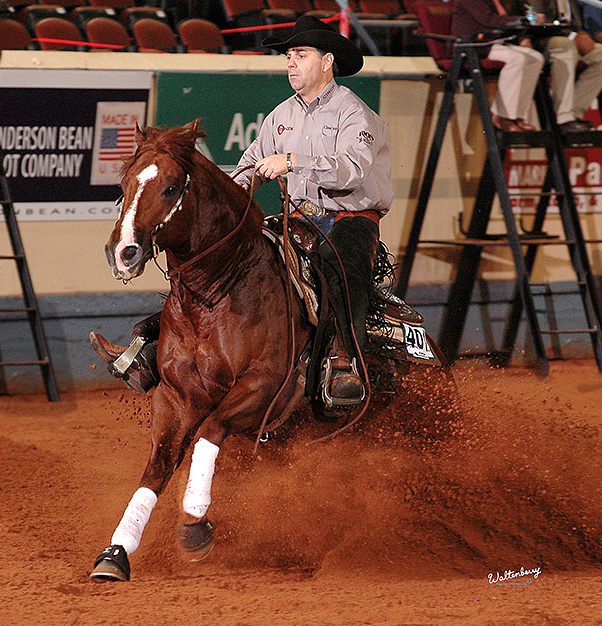 The 3-year-old stallion, owned by Rancho El Fortin of Del Rio, Texas, and Larson showed their fire to win and marked a scorching 224.5 in the second go-round. Their composite score of 447 bested the field by 1.5 points. The Wizster (Gallo Del Cielo x Miss Whizard Jac) and Dany Tremblay also stepped up their performance in today’s section. After earning an impressive 222 in the first go-round, they marked a 223.5 for a 445.5 composite score. They finished in the #1 position in the level 3 open division and in second place in the level 4 open division. The stallion, owned by MG Reiners (St. Paul, Quebec) has earned more than $18,000 this year. Footwork Revolution (Einsteins Revolution x Fancy Footwork) and Brian Bell (Hinton, Okla.) racked up a composite score of 444.5 with their run yesterday. They ended the second go-round in second place in the level 3 open division and in third place in the level 4 open division. Dual Shot Doc (Nitro Dual Doc x Savannah Hickory, owned by WW Ranch, LLC) and Robert Chown added a score of 220 to the 221 from the first go-round. Their composite score of 441 topped the level 2 open division and place third in the level 3 open division. 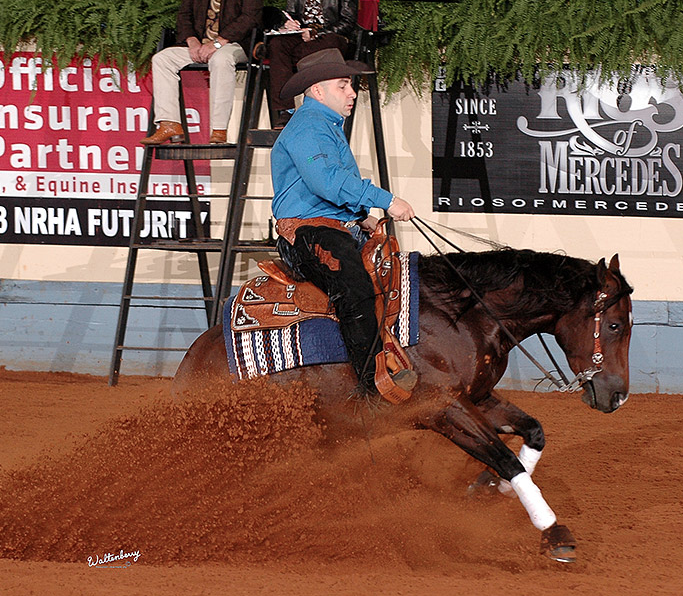 XCS Ranch’s Revolution Is Dun (Einsteins Revolution x Miss Whiz Dunit) and NRHA Professional Martin Larcombe (Gordonville, Texas) turned in two solid performances to move into second place in the level 2 open division (440). In the level 1 open division, Wallys Chic (Walla Walla Whiz x Smokes Chicalito) and Kim Obenhaus received a 214.5 from the judges in the second go-round to earn a 431.5 composite score. They won the division composite for owner MG Reiners (St. Paul, Quebec, Canada). In second place in the level 1 open division composite was Spark Of Starlight (Jacs Electric Spark x Starlight Angela) with Ryan Rushing (Whitesboro, Texas) for owner Shelly MacLellan (Fort Worth, Texas). They earned a 211 in the first go-round and a 220 in the second go-round for a 431 composite score. 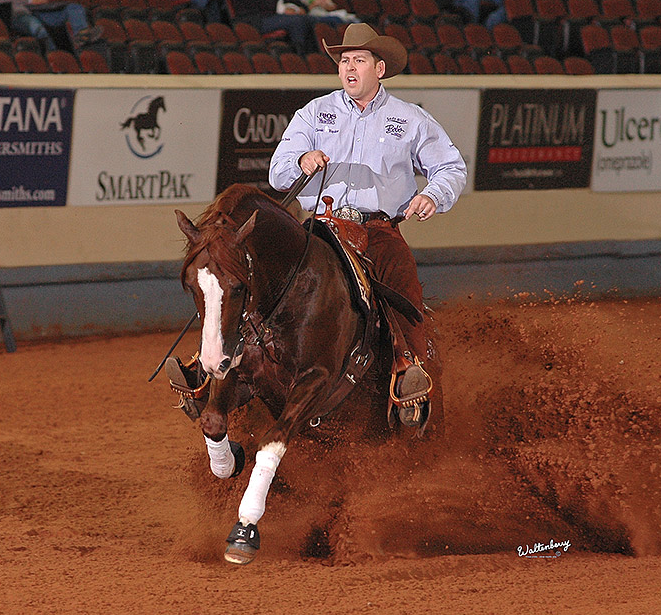 The top open horse and rider combinations, based on composite scores from the first and second go-round, will advance to the NRHA Open Futurity Finals on Saturday, December 7 where the winner of the level 4 open division will earn $165,000 as well as incredible prizes from NRHA Corporate Partners and award sponsors. Watch the free live webcast, keep tabs on full results and get the latest news at nrhafuturity.com, facebook.com/nrhareining or twitter.com/nrha. It’s the most elite reining event in the world with 3,000 entries competing for more than $2 million in cash and prizes. Approximately 1,400 horses and more than 120,000 visitors come from nearly 20 countries to compete and watch the excitement unfold. During its 10-day run, the show contributes more than $67 million to the overall Oklahoma City economy.